KIRK CAMERON’S “SAVING CHRISTMAS” is an engaging story that provides a biblical basis for our time-honored traditions and celebrations, and the inspiration to stand strongly against a culture that wants to trivialize and eliminate the faith elements of this holy season. 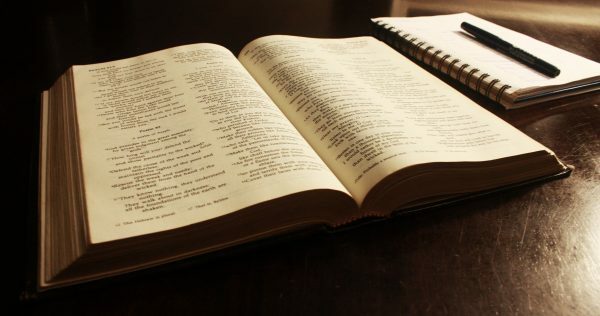 So take in the splendor; take in the majesty; take in the story. Take it all in… and let’s put Christ back in Christmas! 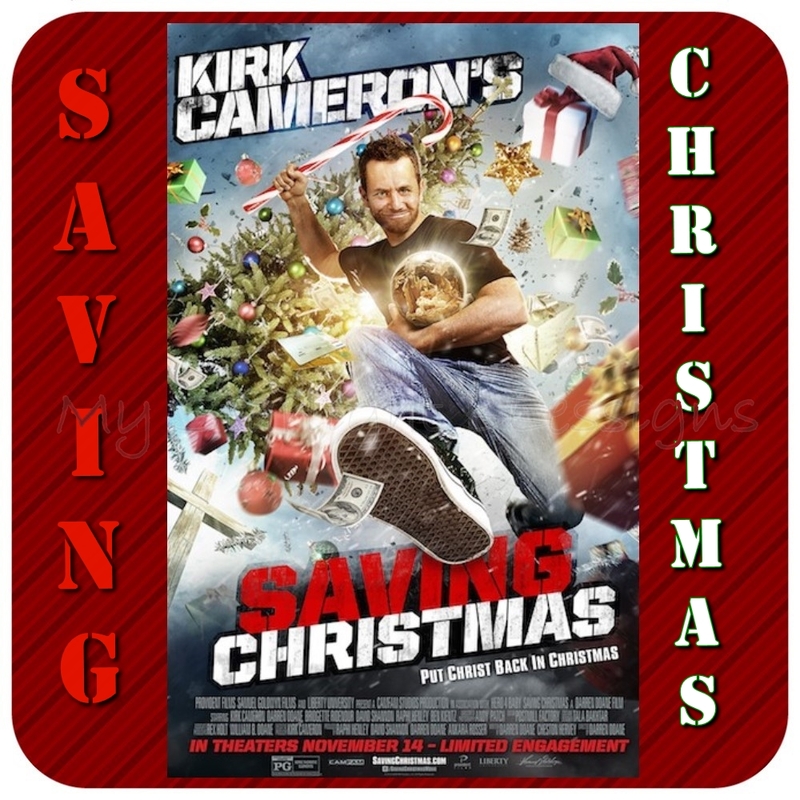 KIRK CAMERON’S “SAVING CHRISTMAS” is in theaters for a limited engagement beginning November 14 for two weeks only! Oh my goodness! I got to do something really neat to get a more in depth understanding of what “Saving Christmas” was all about. I was more than happy to be able to be a part of a group of bloggers on a teleconference call with Kirk Cameron! Yes I got to actually have a question I had for Kirk answered by Kirk Cameron himself. I was muted during this call because well it would be kinda crazy if we all were trying to ask him a question at the same time. Yes it would have been super cool to talk to him myself but this was the next best thing. No complaints here. I asked him, “What is your favorite thing to do with your family for Christmas?” I loved his answer! He said his favorite thing is just being together with his family and people he loves. It didn’t matter where they were as long as they were together. He said he was thankful to have his kids and his wife for another year! He ended my question with saying he was thankful for the one who is Love! At the end of the call he says what he hopes people will do when they finish watching the movie! This was a great experience. Kirk was so nice and funny! I got the chance to watch a private screening of “Saving Christmas” a few days ago for this review. I love anything that has to do with Christmas! I love the food(okay I guess I don’t love the extra pounds that come from the food), I love the smiles of my girls opening their presents, I love being all together in one room, I love that my hubby gets time off of work to be home and I love that my oldest daughter gets weeks off from school to be home with us. I love celebrating the biggest gift of all that never fades away, the gift that always brings hope and the gift that brings joy to so many. The gift of Jesus! This movie started off with an introduction from Kirk Cameron and then preceded with a story that was both goofy and entertaining. Saving Christmas was a movie about the reality of what we and our kids are seeing during the Christmas Season. Some people are saying no to anything Christmas, some are saying only the nativity for Christmas and others are just saying celebrate the presents and Santa Clause but nothing that has to do with Jesus. I can relate because I know there are people in my life that can fit into each of those categories. This movie helps explain why it is important for us to celebrate Christmas and spread the Joy that has been given to us. I did not expect the ending to be what it was(I love when things happen in movies that I never expected). 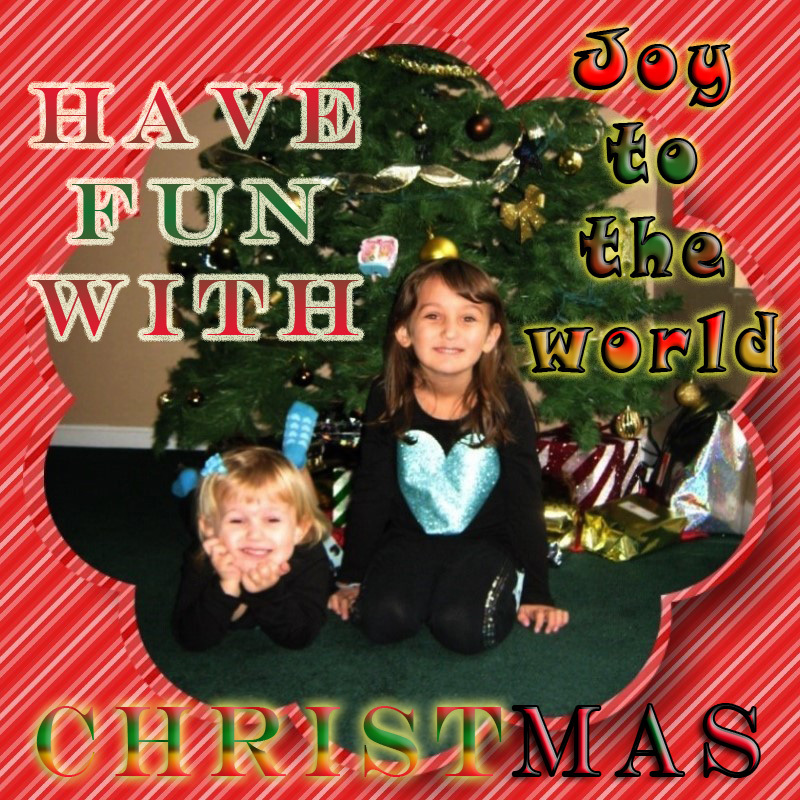 After watching “Saving Christmas” I learned some new things to teach my girls about Christmas and I learned some new ways to keep CHRIST in Christmas! This is a great movie for people of all walks of life. If you don’t know Jesus this gives you some education about why people celebrate Jesus during Christmas and if you do know Jesus and you wonder why people celebrate Christmas with Santa Clause, trees and lots of presents then this movie can give you insight on why these things are not what they may seem. Christmas is a season full of hope, joy and love! Enjoy it! Celebrate it! Go to a theater near you November 14th and watch “Saving Christmas” with the people you love! This is such an Inspirational and Joyful movie! Enter below for an opportunity to win some really cool stuff! 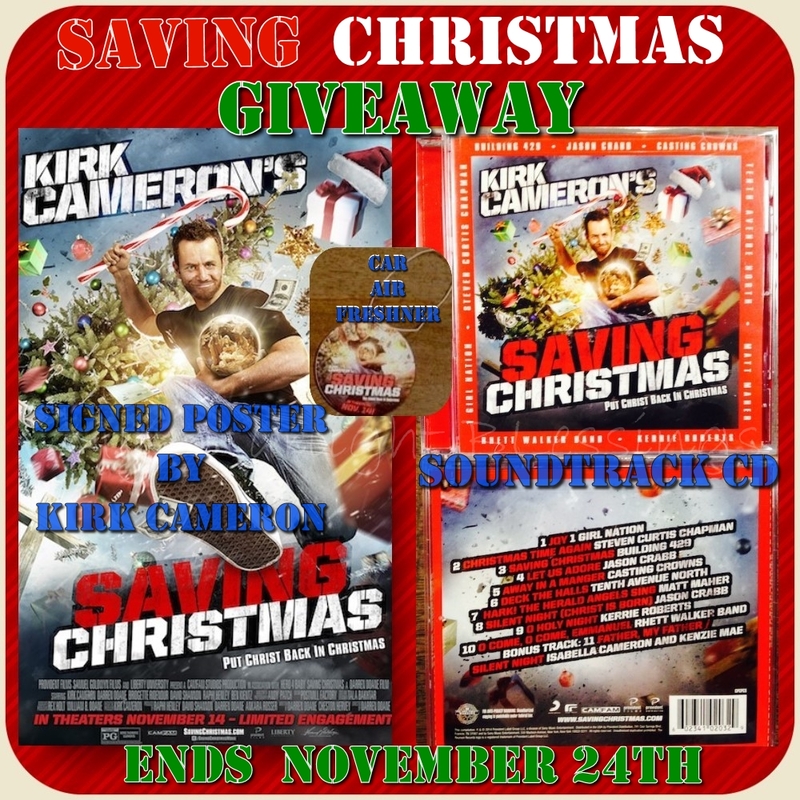 You can win A SIGNED Saving Christmas movie poster (by Kirk Cameron), the soundtrack to the film( I loved the music to this movie), and a car air freshener that smells like a Christmas tree! Good Luck Everyone! Disclosure (in accordance with the FTC’s 16 CFR, Part 255: “Guides Concerning the Use of Endorsements and Testimonials in Advertising”): Many thanks to Propeller Consulting, LLC for providing this prize for the giveaway. Choice of winners and opinions are 100% my own and NOT influenced by monetary compensation. I did receive a sample of the product in exchange for this review and post.Only one entrant per mailing address, per giveaway. If you have won the same prize on another blog, you are not eligible to win it again. Winner is subject to eligibility verification.This giveaway is not associated with any social media it is shared on.